If you want to pitch your story to the press, you have to be able to demonstrate what makes your story relevant now. All the other stuff like, “Should I use a press release distribution service?” or “How do I track down a reporter’s email address?” is irrelevant if you can’t explain why your story is newsworthy. That’s why we created this easy guide to help you create a timely angle for your story idea that will hook a journalist. 1. Provide a twist on trending news. If a particular trend or topic is hot in the media right now, you can bet that journalists are scrambling to one-up each other with new stories. 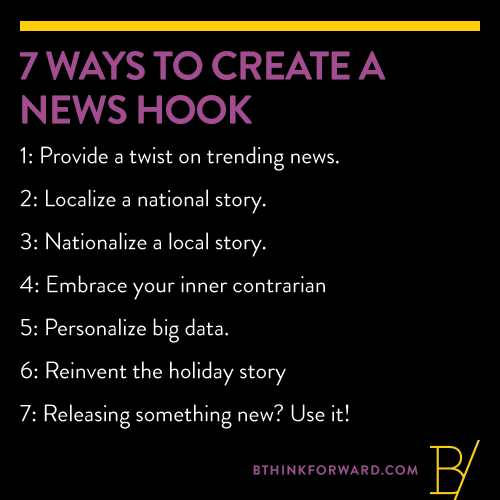 You can fill that void — but you absolutely, positively must show up with a twist to the story they’re already reporting. Share a personal story, a surprising survey result or the contrarian view. Pick up your local newspaper or flick on your local ABC affiliate, and you’ll see countless examples of businesses that got their 15 minutes by being the local example. These types of stories are the bread-and-butter of your hometown press. This trick also works in reverse. Scan you local news for hometown stories and ask yourself: Does this story have national relevance? How can I frame it for a reporter, and insert myself in the story in the process? This is how a lot of freelance writers get their ideas — and it can work wonders for you, too. Objective journalism these days often hinges on getting “both sides of the story.” If you’re seeing a one-sided media conversation about your industry, it’s an opportunity for you to break through as an expert — especially if you’re willing to champion the underdog opinion. Your least popular beliefs may be your ticket to the spotlight . . . tweet it! Sick of reading the same-old holiday or seasonal stories? Journalists are tired of writing them. And, yet, it’s inevitable. Every Mother’s Day, you’re going to read countless stories on gifts for mom. If you can give a reporter a new spin on that seasonal feature she has to write every year, you’re on the fast-track for being her go-to source when she’s writing a story on a deadline. This is the most obvious way to create a hook, but it’s my least favorite (look! I’m being a contrarian). Most of the time, your new product or service isn’t newsworthy in itself, and announcement press releases are the biggest waste of time for you and for a journalist. But (and this is a big but), if you can demonstrate how your product or service is new and that it ties into a trend, you’ve got a great hook.